New Disease Reports (2009) 19, 1. Artemisia annua is the source of artemisinin, an antimalarial compound recommended by the World Health Organisation. Widely cultivated in China and Asia, Artemisia is a new crop for Africa and is largely limited to Kenya, Tanzania and Uganda. African cultivation is anticipated to increase in response to growing demands for artemisinin-based drugs and suitable environments for growing A. annua have been identified in several African countries (Simon et al., 2006). Few pests are recorded from A. annua and limited consideration has been given to its potential pests. 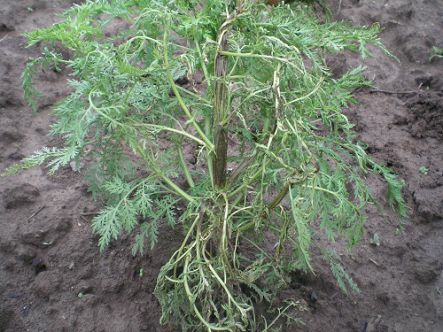 A disease of Artemisia was first noted in August 2007 in Kamuganguzi, near Kabale (South-west Uganda; 2210 m above sea level; 1°20'20''S and 30°00'9''E).Affected plants initially show longitudinal water soaked stem lesions, characteristic of a bacterial infection, which turn into necrotic streaks that split open to expose the pith or result in stem breaking (Fig. 1).Leaves borne on affected parts wilt and die (Fig. 2). Yield loss has not been quantitatively determined, but seedlings can be killed and mature plants defoliated with incidence of up to 28% (Ssekiwoko, unpublished observations). Bacterial isolation from leaf material was undertaken in Uganda on yeast extract peptone glucose agar (YPGA). A shiny yellow convex, mucoid, bacterial colony dominated isolation plates after 48hrs of incubation at 27°C. Single colony sub-cultures were taken to ensure purity, and cultures sent for identification at the Central Science Laboratory. Identification was by fatty acid profiling (MIDI system) and sequencing of the Gyrase B gene (Parkinson et al., 2009). Both approaches revealed closest similarity to Xanthomonas hortorum (Midi ID score = 0.735; sequence similarity to X. hortorum type strain NCPPB939 = 96%).Pathogenicity on A. annua was confirmed by topical spray inoculation (approximately 107 cfu/ml), followed by a 24hr period in a sealed polythene bag and growth under controlled glasshouse conditions for two weeks (minimum temperature 25°C) after which symptoms characteristic of the disease observed in the field were obtained. 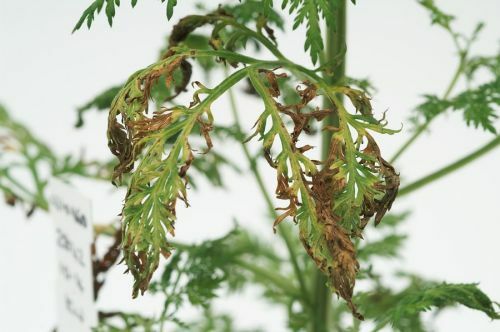 This is the first report of a Xanthomonas hortorum strain pathogenic on Artemisia. A reference culture is held by the UK National Collection of Plant Pathogenic Bacteria, Accession No. NCPPB 4435. The GenBank Accession No. for the gyrB sequence is EU815325. Simon JE, Park C, Wu QL, Diatta M, Diouf B, Wilde B, Asante-Darty J, Acquaye D, Quansah C, Ferreira JF,2006. Artemisia annua: Production in sub-Sahara Africa.Association for Advancement of Industrial Crops (AAIC) 6th National Symposium:Creating Markets for the Economic Development of New Crops and New Uses. San Diego, CA. October 14-18, 2006, 74 (Abstract). Parkinson, N, Cowie, C, Heeney, J, Stead, D, 2009. Phylogenetic structure of Xanthomonas determined by comparison of gyrB sequences. International Journal of Systematic and Evolutionary Microbiology 59, 264-74.